Larry Ladowski with his 47-by-26-inch, 40-pound trophy laker. SpiderWire 50-pound braid with a 6-ounce inline bead chain and fluorocarbon leader are key components to trolling for trophy trout. In addition to providing a beautiful setting, the glacial retreat of the Canadian Shield area also provides a natural, ideal environment for one of Canada’s most sought-after species—the lake trout. 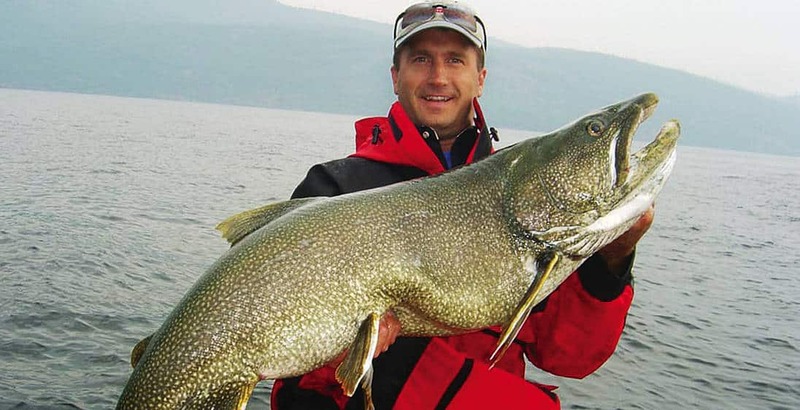 Lake trout prefer a colder water environment, and many of the Canadian Shield lakes throughout Saskatchewan, Manitoba and northern Ontario provide this deep coldwater habitat with portions of lakes diving to depths several hundred feet deep. 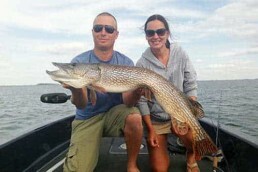 These lakes provide ideal habitat for lake trout throughout the season. During the spring as the ice on lakes thaw, lakers roam the shallower reefs and shorelines along with many species looking for forage after a long winter. Once summer arrives and water temperatures rise, lakers will move to the colder, deeper holes, and remain there all summer. The pattern reverses in the fall as water temperatures cool off again, bringing the lakers shallow again to spawn and feed for their upcoming winter respite. 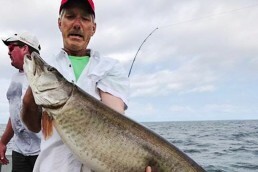 With this in mind, catching lake trout requires a few different techniques, depending on the time of year. However, one thing remains constant: good electronics are extremely important for finding and catching lake trout. Lake trout congregate around reefs. Therefore, finding them is almost impossible without depth gauges and fish finders. They will suspend in open water and move to the reefs when feeding. How shallow they move into depends primarily on water temperature. 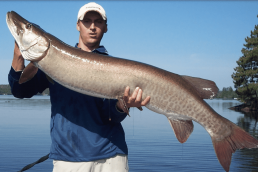 In spring, casting spoons and rattlebaits along rocky reefs, some sandy flats, islands or lake inlets, particularly those with waterfalls, is an exciting way to catch them. To be able to cast a lure only to have it slammed by a feisty laker and then have it tug, twist and dive all the way back to the boat is a treat for an angler. When these lakers move to the deepest holes in the lake system for colder water, finding these holes requires some knowledge about the particular lake. You can do this with good electronics. Ideal summer spots are deep holes with access to shallower reefs and humps. Lakers will suspend over these deeper holes and move back and forth working reefs for forage. During summer and early fall, lakers can be caught using a vertical-jigging technique working Buzz Bombs, heavy jigs tipped with plastics and various gulp baits, fluttering spoons, blade baits and others. Using heavier spinning or baitcasting rigs, drop down your lure to the desired depth and rip the rod up quickly, and then slowly let the lure saunter down. This quick darting “up” motion will attract the lakers, and the slower “downward” motion will cause them to strike as they think it is an injured bait of some kind. Pay close attention on the fall of the bait; this is when they usually strike. If jigging isn’t your passion, then troll deep rocky structures and reefs. Here, get your heavy-action baitcasting rod rigged with a line-counter reel. A line-counter reel is beneficial as an indicator to getting and keeping your bait in the general area of the depth where you’re marking fish. Once again, using your electronics, begin trolling along the deep reef structures of the hole. My rig consists of 50-pound-test SpiderWire line with a 6-ounce inline Uncle Josh Bead Chain sinker weight tied on the end to get the lure down. 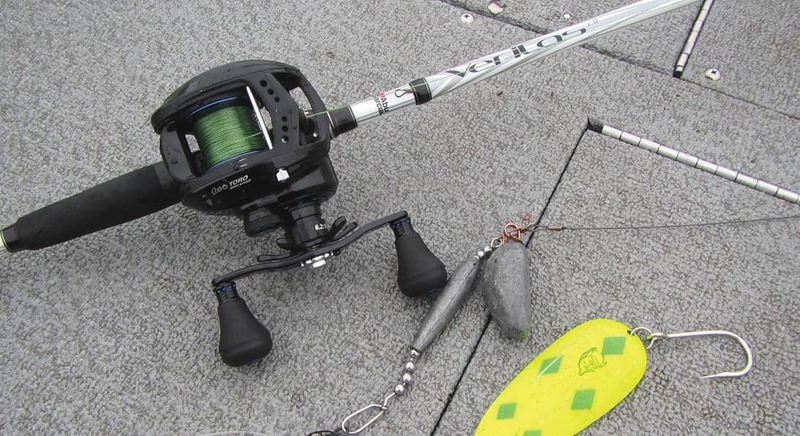 Then, tie on about 5 feet of 40- to 50-pound-test Yo-Zuri fluorocarbon leader leading to a large Dardevle spoon. Troll slowly around 2 to 3 mph, letting the lure drop to the depth that you are marking fish on your electronics. Lakers will follow lures without striking, but sometimes going into a turn will tend to speed up or slow down a lure, giving it enough of a change of action to make fish strike. You may want to experiment with speed when this happens. Once the fall season hits, lakers will once again begin moving back to the shallower reefs to begin their spawning season. The normally olive-bronze lakers will transform into their red, gold and white warrior-like colors rising from the depths and as they move to the shoals and reefs into a spawning rage. Although it’s a tough time to pinpoint them, the unbelievable strength they possess during the fall from hormones of the spawning season, along with the colder oxygenated fall waters, makes them even more fun to target. Once again, spinners, spoons, jigs and brightly colored crankbaits getting crushed in 6 to 10 feet of water is terrific when you time it correctly. Lake trout, whether catching the common variety of 3- to 5-pounders or bringing in a trophy 40- to 50-pounder, are a spectacular species to target in Canadian waters.